Dry rot (also known as brown rot) is one of the most damaging forces on household wood in the world. Approximately 20 billion board feet of timber is destroyed by wood rot in the United States each year-- far more destroyed wood than is damaged annually by fire! Replacement wood used to repair damage caused by wood rot accounts for almost 10 percent of the annual wood production in the U.S. alone. Silver River Basement Systems has a long history of experience in eliminating, preventing, and controlling dry rot infestations in homes throughout Colorado & New Mexico, including Grand Junction, Durango, Farmington NM, and areas nearby. If you have a dry rot problem in your home, call or e-mail us today for a free dry rot removal and control estimate! 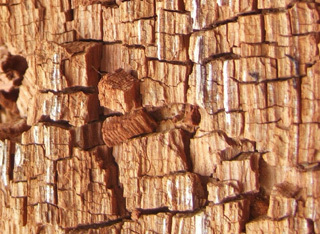 "Dry Rot" is a term most often used to describe a particular kind of dry, cracking, rotting wood. However, dry rot occurs because of a variety of brown rot species, most notably the "true" dry rot fungus known as Serpula lacrymans. It originally got its name from the thought that it did not need water to survive and used a fermentation process to survive. This has long since been proven untrue, and it is now called, more appropriately, "brown rot", although the old name hangs on. However, dry rot needs much less moisture than other types of wood rotting fungi -- a wood moisture content of just 28-30% -- to survive. While there is no official proof on the subject, many contractors have observed that dry rot also will not grow on wood with too much moisture. Architect's Journal reports that dry rot can grow through damp mortar, concrete, masonry and behind plaster to establish itself in other areas of the building. This can make treatment of dry rot complicated and expensive, and it can mean that future problems with dry rot can arise unless the cause of the problem is addressed first. Treatment of the wood with fungicides and products such as boric acid are known to eliminate and prevent dry root fungi. Even dry rot needs wood with 28-30% moisture content to thrive. Wood with less than 25% moisture can remain free of fungi for centuries. A common first indication of dry rot in a home is the appearance of a "red brick dust". As the wood cracks and deteriorates, it's not uncommon for homeowners to mistake the dry rot damage for termite damage. However, while damp and rotting wood is more likely to damage termites, having dry rot does not mean that there is a termite infestation. This is actually an accumulation of fungal spores that are covering the surface, waiting for the proper conditions to start to grow. Remove all wood that shows decay or visible fungus, as well as all wood within one meter of the visible decayed material. Remove all plaster, paneling, linings, and ceilings around the dry rot areas. Using a wire brush, clean off all surfaces, including metal and pipes, within 1.5 meters of the furthest edge of the infection. Clean up all dust and debris from the work. Apply a fungicide to all masonry, concrete, and exposed dirt in the area. Apply two coatings of fungicide to all wood surfaces within 1.5 meters from the damage. 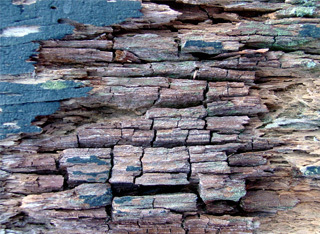 Replace wood rot infected timbers with fungicide-treated wood. Silver River Basement Systems can help you eliminate dry rot problems at their source. We can dry your basement or crawl space, eliminate flooding problems, and seal out outside humidity. This not only eliminates dry rot problems, but also creates an environment that's inhospitable to mold, wet rot, and mildew, as well as keeping out termites, carpenter ants, cockroaches, crickets, and other household pests. We offer FREE, no-obligation dry basement and crawl space quotes in all our service areas. We can answer all your questions and point out the sources of humidity and moisture in your home. Call or e-mail us today to get started on a healthier, better-preserved home! To contact us, call 1-833-407-7167 or contact us online today! 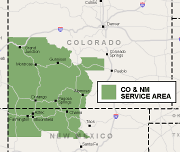 We serve Colorado & New Mexico, including Durango, Grand Junction, Farmington NM.